The millet group of plants, like rice and wheat, are grasses that produce small, edible seeds. Archaeologists have long known that they were domesticated very early in China and India; the earliest known noodles, which are 4000 years old and were reported by a Chinese team in 2005, were made of millet. Although rice was domesticated in China’s warm and humid south, millet was domesticated in the north of the country, where conditions were much colder and drier. Archaeological evidence suggests that millet was cultivated as long ago as the Xia Dynasty (21st – 17th century BC) and Shang Dynasty (1600 BC-1056 BC), primarily around the Yellow River basin, northeast China and Inner Mongolia. Yet archaeologists have debated whether these developments were independent or whether rice farmers from the south migrated north and began to cultivate wild millet–which grows much better than rice does in cold and dry conditions–thus transforming it into domesticated varieties. Millet (xiaomi ‘small rice’ in Chinese) was the sustenance that Chairman Mao and the Red Army relied on to sustain them during the arduous campaigns against the Kuomintang and the invading Japanese. Perhaps even more importantly, depending on how you look at it, millet was also one of the first grains used to brew liquor. Millet itself retains some of the properties we might associate with the soldiers who relied on it back in 30s and 40s. While it prefers a warm climate, it possesses the ability to adapt to other environments, as well as being remarkably drought resistant and able to survive in poor, heavily acidic or alkaline soils. In short, it’s the kind of food you want to back you up in a tough situation. Perhaps this is why, in some parts of northern China, it is also traditionally eaten by mothers after giving birth. The grain is mixed with brown sugar and boiled, providing a much needed nutritional boost for recovering mothers and their babies. For similar reasons, the elderly are also advised to gobble down a bowl of millet congee every day before going to bed, to provide energy and help get a good night’s rest. 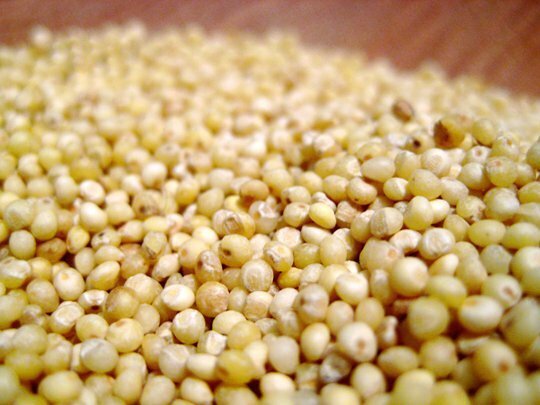 For the life in between these stages, traditional Chinese medicine teaches that millet will help nourish yin, remove humidity, strengthen the spleen and stimulate the appetite, as well as nurture the liver and help lift blood production. From the Western perspective, millet falls down when compared with other grains in terms of providing nutritional value, primarily because the nutrients it does contain are hard to digest. However, it is rich in calcium, phosphorous, iron, carotene, Vitamin B1, Vitamin B2, niacin, zinc, manganese, selenium and estrogen, amongst other things. Not bad for a grain that unlike rice does not even need to be refined before it is consumed. 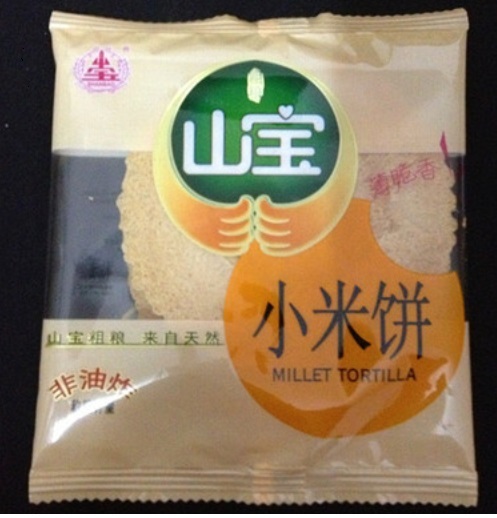 Millet is currently being rejuvenated in China, as part of a revival of ‘coarse grains’. Obesity is a growing health problem in China and eating more coarse grains is regarded as one way to fight overweight. There is also a nostalgic trend to revive ‘rural cuisines’ in China’s major cities. This is another opportunity for millet to return to the Chinese dinner tables. A brand promotion meeting for Shanxi millet was held in Taiyuan, capital of Shanxi province, Feb 27, 2019. Nine companies were selected to be members of Shanxi Millet Industrial Alliance which is comprised of 28-member businesses attending the meeting. Several regional millet brands such as Changzhi millet, Yangquan millet, and Wangxiang millet, have been established in recent years, bringing greater economic benefits to local farmers. Apart from further expanding the market in Beijing, Shanxi will explore new markets in Shanghai and Shenzhen in 2019, according to Wang Yunlong, director of Shanxi Food and Strategic Reserves Administration. Promotion events for Shanxi millet will be organized in Shanghai and Guangdong province. Members of Shanxi Millet Industrial Alliance are encouraged to carry out marketing campaigns targeting senior residents, workers and students as well as develop supermarket counters and outlets selling millet. 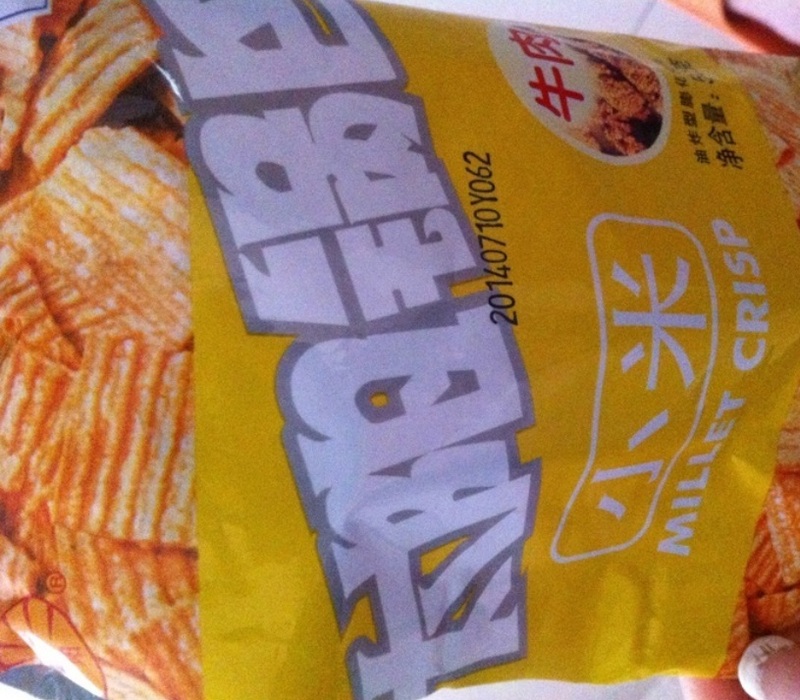 So what finished foods based on millet are available on the shelves of Chinese supermarkets? I will introduce a few. I already introduced babao porridge in one of my earlier posts. Millet can be used as the basic raw material instead of rice. In fact, porridge is the most typical way to eat millet in China. During the colder months, vendors selling millet porridge can be found on many street corners in Beijing. Fensi, glass noodles are usually made from rice (and occasionally from lotus root meal), but again, millet can be used as raw material as well. 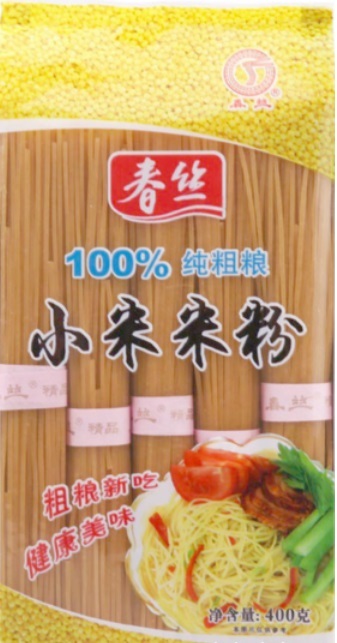 The Chunsi brand glass noodles are market as ‘made from 100% course grains’.